A visit to the exhibition at the Natural History Museum, London. Mammoth, a ferocious predator with huge downward curved tusks to catch and hold its prey! If only the original interpretation had stuck then maybe some in our party wouldn’t have left the mammoth exhibition saying “the giant short faced bear is my favourite extinct monster”. The largest carnivorous mammal of North America had made more of an impression than the ice age icon, the mammoth. Charles Peale’s 1801 find of a “mammoth” skeleton which he mounted with downward curved tusks certainly caught the attention of US president Thomas Jefferson who sent an expedition to the western wilderness to find living examples. Presumably so rich people could then go out and hunt them for sport. On the other side of the world, the native people of Siberia had their own ideas about finds like this one. They called the creatures “Mammut”, a giant mole that burrowed underground and died on exposure to light. Perhaps the no photography signs by the exhibition’s star Lyuba the baby mammoth are in case she is not dead, just resting, and your flash could finish her off. Whilst the mole idea wasn’t going to work, the name Mammut had a ring to it so the unknown creature became Mammut or mammoth in English. Now whenever there is a good story, there will often be a scientist nearby to ruin things with some inconvenient facts. Apparently, technically, Peale’s find which had been given the scientific name Mammut, wasn’t a mammoth, but a relative, the mastodon. So mammoths got a different scientific name Mammuthus. But this was closing the stable door after the mammoth had bolted, which explains why you may find yourself climbing a mountain in a t-shirt with a mammoth logo on the front but the word Mammut (mastodon) on the back (other outdoor wear brands are available)! So perhaps the title needs revising to Mammoths and mastodons. And not all were exactly giant, only the Colombian mammoth from America was larger than modern elephants, this will not surprise anyone like myself just back from a holiday in the USA where everything is supersized. Well not quite everything, remains of dwarf mammoths have been found on islands off the coast of California! With questions of names and size sorted the exhibition takes visitors on a journey through time back through the last glaciation and the Quaternary Ice ages, guided by an American scientist with his time machine made of mud, explaining how scientists can reconstruct the mammoth’s environment, GEOG 1001 summed up in a 3 minute video. Visitors roam with the mammoth from Africa into Eurasia and across the now submerged land bridge in the Bering Strait to North America. Whilst the Mammoths went extinct with the last known survivors’ succumbing on Wrangel Island Siberia 4000 years ago, their relatives live on as elephants in Asia and Africa. In Kruger National Park scientists are racing to learn all they can about elephants as they fear they are about to face the same fate as the mammoths. There is a shocking resemblance between the fragmented populations of Mammoths in their decline, compared to their previous distribution thousands of years earlier, and elephants just 200 years ago and today. The last word belongs to the Siberians, not content with giving the world the word Mammoth, they also found the exhibition’s star attraction Lyuba, the cutest baby ice age giant you ever saw. Lyuba’s remains preserved in the permafrost have proved a treasure trove of clues about the lost world of the ice age giants. Unless the world stops to listen to Lyuba’s story the future of the world’s elephants could be as a special exhibition in a natural history museum. 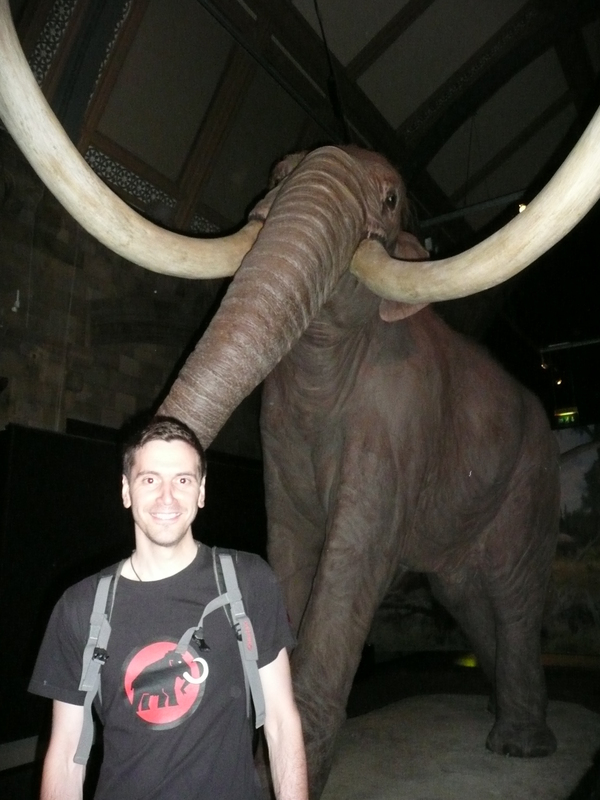 Mammoths- Ice age Giants is on at the Natural History Museum in London until 7th September. The museum’s Mammoth expert Professor Adrian Lister has a book published to accompany the exhibition.